Androgynous spoilers ahead for Assassin’s Creed IV: Black Flag. Cards on the table, I loved Assassin’s Creed III. I liked its shift to the frontier and the less-developed, less vertical American colonies. I liked the shift in protagonist from a headstrong, aggressive lead to a quieter, more passive hero. Or at least, as passive as a skilled murderer can get. I loved the end in the bar. And man did I love driving an old, old wooden ship. But I kind of figured I was the only one. The tale of Captain Jack Sparrow. Turns out there were enough people, or at least the perception of enough people, who dug driving an old, old wooden ships that it warranted an entire pirate-themed sequel, Assassin’s Creed IV: Black Flag, where you drive an even older old, old wooden ship. One of the downfalls of releasing a franchise annually is that it can blur just how much progress a franchise has made. When I hit the credits of Assassin’s Creed back in 2007 there’s no way I could have predicted Black Flag was six years away. The Assassin’s Creed mythos and its centuries-spanning narrative has always been about freedom and that theme continues in Black Flag through both the plot and the gameplay. You can essentially carve out a nice little career for yourself as a Caribbean pirate without ever delving more than ankle deep into the assassin/Templar conflict that is the staple of the Creed games. Fight in the never ending war for the enlightenment and freedom of all mankind if you want, I guess. Or Go hunt for treasure, explore islands and become a thorn in the side of lobster colonialism! 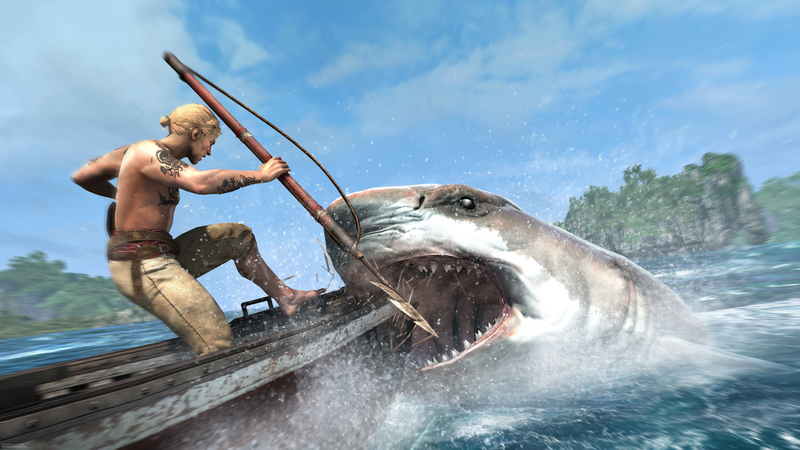 Go skin a panther or dive amongst shark-infested sunken ships! All of this and more await you in Assassin’s Creed IV whether you spend any time with assassins and creeds or not. I would never murder a Great White shark, the planet’s most majestic beast, in real life. For a number of reasons. But Black Flag, William Wallace that it is, gives me the freedom to harpoon the devil fish to death and, god willing, extinction! And believe me, there were a lot of orphaned sharks in the ocean before I ever got into the thick of the game’s swash-buckling plot. In short: it’s a good time. 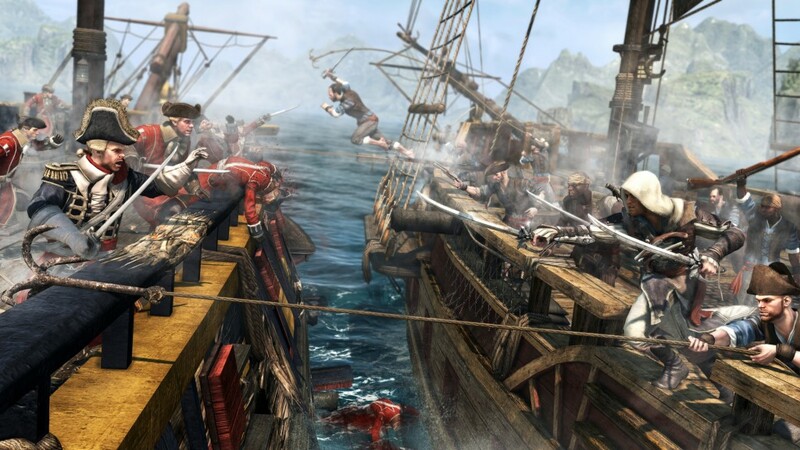 Assassin’s Creed IV is the definitive pirate experience. But for a game that works so hard to embody freedom, its handling of slavery and the disenfranchised people of the African diaspora is a pretty mixed bag. 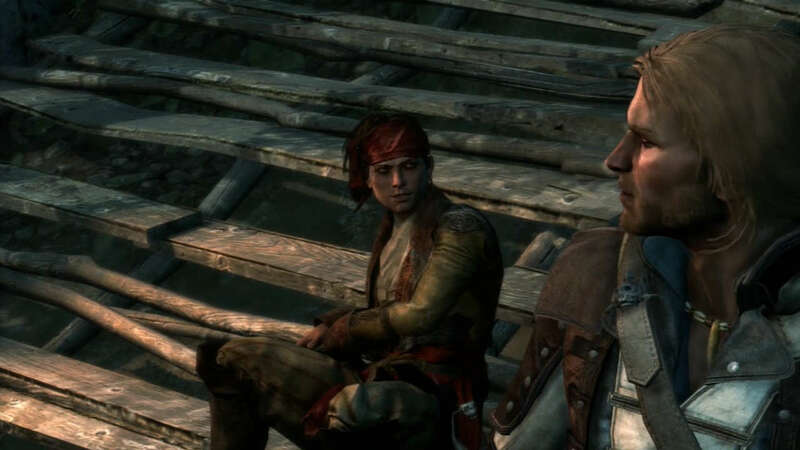 Early in the main story of Black Flag the protagonist, Edward Kenway, finds himself chained in the brig of a Spanish slave ship with Adéwalé, a black man. In one of the coolest levels I’ve played in this past generation of games Kenway and Adéwalé escape their shackles, highjack a ship and escape the Spanish fleet. It’s insane. Seriously. Assassin’s Creed IV is great. 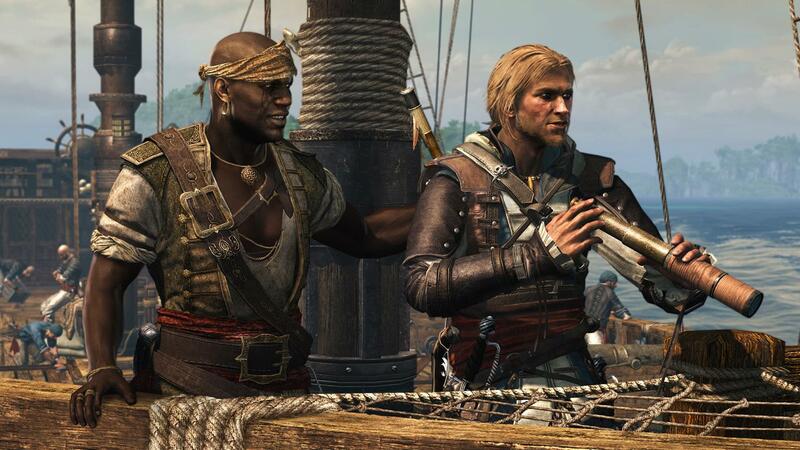 When the waves settles and Kenway and Adéwalé stand at the wheel of their new ship before a cast of freed prisoners now their crew they discuss their next move and have one of the more blunt discussions of race I’ve ever seen in a game. Adéwalé can’t be the captain of the ship because he’s black and the otherwise white crew, perhaps including Edward, though it isn’t said either way, isn’t going to listen to him, because to be black in the age of colonialism is to be a slave. Which is why the roguishly handsome, blonde and blue Kenway becomes captain, with Adéwalé serving as his right hand man. Look over there! Off the starboard bow! It’s Critical Race Theory! It’s a decision the two men arrive at together and though it’s questionable it’s at least an attempt at addressing the racial divide. But while it is a solid enough excuse for why Edward is steering the ship it doesn’t quite address why I the player am steering Edward. After all, what better symbol of the pursuit of freedom than Adéwalé, a former slave? Where’s the 30 second exchange between Adéwalé and Edward that explains why the former can’t be the protagonist of the game? Or maybe a quick bit of expositional dialogue explaining why even the Creed protagonists with darker skin are still half-white? Or why the developers didn’t pull a Metroid and make James Kidd the game’s lead? To be fair Adéwalé is the lead in the recently released ACIV downloadable content, Freedom Cry. And to be honest, I haven’t had the opportunity to play it yet. Could this be testing the waters for more diverse protagonists in the future? Or is Freedom Cry a box to be checked? A been-there, done-that of protagonist ethnicity? Perhaps we’ll find out with the inevitable release of next year’s entry in the franchise. But when I think of what could have been it can be frustrating. The fresh story elements and character moments a game about Adéwalé could bring are exciting to think about. The player identity crisis Kidd could have brought to the fold is tantalizing. I get it. Honkies are great at killing people, be it with hidden blades, assault rifles or laser guns. Would that games would give anyone else a shot. A little less than a year ago I produced the first piece of content for this blog: Gaming and Race in 2012, or, Cut it out White Devils. Games like The Walking Dead and Prototype 2 gave me a lot to think about and a lot to write about. While there were three female protagonists in big name games this year only one was consistently playable and all of them were white. Michael K. Williams was in Battlefield 4. In a rare bright spot, Grand Theft Auto V, a game hell-bent on freedom, illustrated just how limited choices can be for a young black man from a low economic bracket to make something of himself. 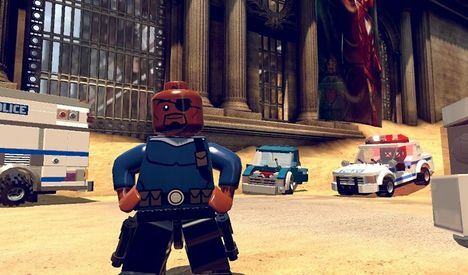 And Nick Fury was black in LEGO Marvel Superheroes. I’m Edward Kenway, prowling through the field of a colonial plantation, searching for the man in charge – the man with a key to a warehouse my crew and I are going to rob. As soon as I get my hands on that pesky key. From the crops the guards and soldiers can’t see me. I wait patiently as guards walk their patrols and slaves toil in the fields mere feet from where I hide. One such slave hacks away at the vegetation with a machete. Curious, I sneak up to him. I crouch right in his face. I am on him. His blade comes down on my head time and time again without effect. Oblivious, the man keeps hacking at me. I circle him several times but he remains focused on his labor, hacking and hacking and the space my face occupied seconds ago. When a chubby guard strays too close to the edge of the fields I take him out and hide the body amongst the crops. Now the enslaved are aware of my presence. They gasp and take several steps back, dropping their tools and beginning to yell, but nobody hears them. I murder the rest of the guards one by one and take their warehouse for everything its worth. In a later mission I’m given the option to free captured assassins. 1. What do you think? I’m I reading too much into it? Am I not reading enough into it? 2. Are there other games this year that handled racial and gender diversity well or poorly? 3. Are you a racist? You might also be interested in the games I complained about the least this year. I would highly recommend playing some assassin’s creed: liberation or at least the additional gameplay (if you have a playstation) that came with AC: black flag. The main protagonist is Aveline, an african-french assassin. She’s black, and she’s female. Thanks for the suggestion, and for reading. I’ve actually played Liberation on Vita. Looking back on my 2012 Gaming and Race post I wish I could think of an excuse for why it isn’t include, as its omission was quite a blunder. The persona system in that game was particularly interesting with her shifting between the roles of high society lady, faux-slave and assassin and each role having a different social impact on the world around her. Unfortunately that same game mechanic also got frustrating to no end. But I never did beat that game. Your mentioning it has definitely inspired me to take a second look at it. And I do have the PS3 version of Black Flag but I haven’t checked out the additional game play yet, so I’ll have to get on that as well. Perhaps Aveline will be the protagonist of a major, and less frustrating, installment of the franchise one day.